I was asked to create serviettes that could be used for decoupage projects. I used Dala Drawing Inks, because once dry, they form a permanent film. I chose to fold the tissue paper, then to paint on the colour. (I loved the anticipation of not knowing what the results would be!) 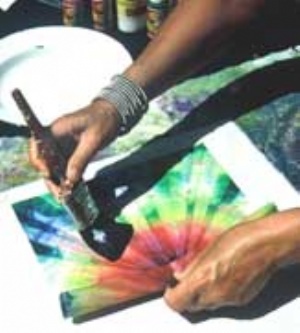 Don’t forget though, you could also be more specific and create lovely hand painted serviettes. This paper can be applied to surfaces such as wood, plastic, tin or candles, using the appropriate Dala decoupage mediums. Cut the tissue paper to the required size. Fold the paper. It’s important not to have areas that are too thick or too thin. Once you are satisfied with the folding, wet the paper and squeeze out the excess water before you brush on the drawing ink. 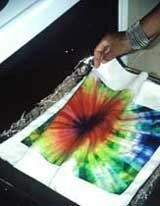 Don’t wait for the paper to dry before unfolding, the ink will cause the paper to stick together, and you’ll never get it unfolded! The next step requires a little patience and care. Use the hairdryer to dry off some of the moisture, and start unfolding. Continue the process until the paper is completely unfolded. 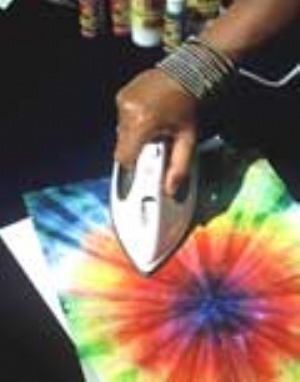 I prefer to iron the paper before using it on a decoupage project. 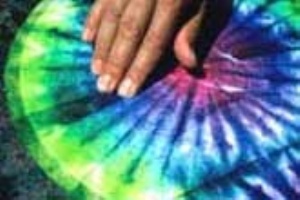 Working on an old towel, brush the waterproofing medium over the entire fabric surface where the paper is to be applied. The tissue paper needs to be applied to the wet fabric. Roll the tissue paper up, so that only a small bit is exposed. 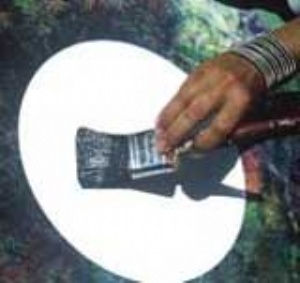 TIP: The bigger the area to be covered is, the bigger the paintbrush should be. strokes continue until the paper has been applied. 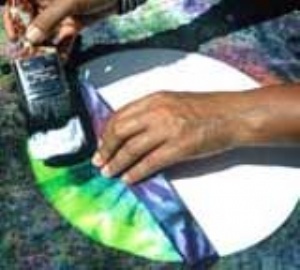 Once the paper has been applied, you can use your fingers to smooth out the wrinkles. 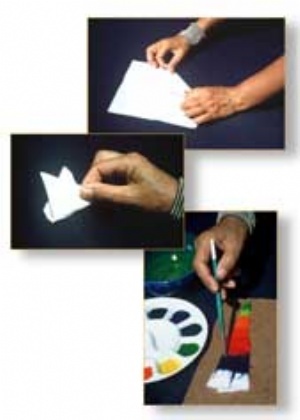 Do this with some of the medium on your fingers to avoid getting your fingers stuck to the paper! Once the fabric has dried, it needs to be heat set / cured. Pre heat the oven to 150 degrees C.
Place the fabric on a tin foil lined baking sheet in the oven for three minutes. NB: Keep an eye on the fabric - turn it around after one and a half minutes. Don’t be alarmed by the vapours that are released, it is part of the process. The fabric is not only suitable for tablecloths and placemats, but can also be used for upholstery, cushion covers, aprons, bags, rain resistant jackets – the applications are limitless. Using the epoxy putty, fill the hole in the centre of the record. Once dry, sand smooth, using the water paper. 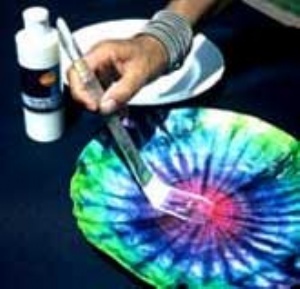 Using the sponge and the white craft paint, paint the record. Apply the serviette in the same way as we did to the fabric. Using a pair of scissors, cut off the excess paper. Pre heat the oven to a 100 degrees C.
Using oven gloves, remove record from the oven carefully, and gently form a pleasing shape. Note: the record can be re heated and re shaped until the desire shape is achieved. Finish your record bowl by applying a coat of Dala Acrylic Matt Glaze medium. Note: These bowls are not dish-washer safe. They are however suitable for: snacks, rolls, fruit and THE like. 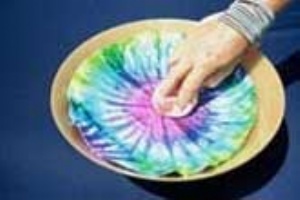 Clean by wiping with a wet soapy cloth and dry before packing away. This item has 682 views.